Having dealt with the legacy of Dracula in the previous review, it seems appropriate that we turn now to another great staple of late-nineteenth century fiction with Dr Jekyll & Mr Hyde. Once again, you may have trouble hunting down a copy of this particular production, but in this case the problem is not the result of marketing division re-branding. Nor is it even a matter of genuine scarcity, although this exacerbates the issue in terms of general public awareness. Rather, the main difficulty lies in attempting to pick out this particular version amidst the bloated catalogue of films bearing an identical title, one of which was released in the same year as the production in question. To clarify, this review is dedicated to the version which features John Hannah in the titular roles, accredited as being released either in 2002 or 2003. As it happens, this frustrating triviality characterises much of the difficulty faced by this, or any other production that aspires to make a faithful adaptation of this particular literary classic. For the most part, however, this treatment manages to address these latent issues with enough skill to maintain interest, whilst also injecting a sufficient degree of originality. The greatest impediment to any literal adaptation of R.L. Stevenson's classic novella is that Strange Case of Dr Jekyll and Mr Hyde is essentially a one-trick pony. This is not to impugn its quality, but rather a simple product of its specific form. One must remember that, despite the fact that Jekyll/Hyde has come to rank alongside the likes of Dracula and Frankenstein as the pre-eminent gothic figures in popular culture, there is a great difference in their various original forms. At a mere seventy-odd pages, Strange Case is a product of the vast nineteenth century trade in serialised, inexpensive fiction commonly referred to as 'shilling shockers' or 'penny dreadfuls' – antecedents of the pulp magazines which proliferated during the first half of the twentieth century. The fact that Stevenson managed to distinguished his tale amidst this morass of castaway entertainment is due entirely to the calibre of his writing and the outstanding quality of his central idea. Of these it is the latter, especially, which has seen the tale consistently punch above its diminutive weight, creating a legacy that continues to hold its own beside those of its novel-length peers. Indeed, in one respect the enduring influence of Strange Case is virtually without parallel, and while this affords some unique advantages, it means that any attempt to follow in its wake is also faced with peculiar challenges. In essence, the one trick at the centre of Strange Case proved to be so captivating as to leave behind all memory of the device through which it was revealed. One need only reflect upon current popular culture in order to gauge the truth of this statement. So firmly entrenched is the central idea of the tale that the mere name Jekyll/Hyde is enough to elicit instant recognition, even from those who have never encountered one of the myriad adaptations, let alone read the original. For a tale so completely geared toward revealing the mysterious connection between the respectable Dr Henry Jekyll and the disreputable Mr Edward Hyde – to the exclusion of any peripheral concerns – the voracity with which the common populace consumed the underlying idea made the narrative itself largely redundant. There are modern equivalents, in films such as The Usual Suspects and The Sixth Sense, but never in the history of film or literature has a fictional archetype become so firmly entrenched in the common psyche as that denoted by the term Jekyll/Hyde, nor indeed so completely independent of the work itself. The difficulty which Dr Jekyll & Mr Hyde faces is thus dealing with the fact that the story is largely unknown, while the big reveal at its centre is perversely known to all. In effect, how can one faithfully translate a mystery story whose very name instantly dispels its secret? The answer, in this case, is to undertake a subtle realignment in approach. The first nine chapters of Strange Case are primarily concerned with Mr Utterson – a lawyer and friend of Jekyll – as he attempts to uncover the link between the titular personages. This sequence ends with the discovery of Jekyll dead in his laboratory, with the tenth and final chapter consisting of a 'full statement of the case', which covers the same period of time from the doctor's enlightened perspective. 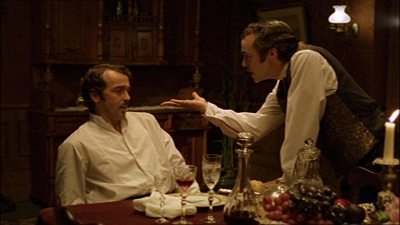 It is this transition between the two narratives where Dr Jekyll & Mr Hyde begins; the primary drama is construed as a flashback with brief scenes of Utterson reading Jekyll's confession interspersed throughout. This rather innocuous device proves to be the cornerstone of the film's ultimate success, and is all the more inspired for its simplicity. Choosing to embark at this point in the narrative effectively dispenses with the nine chapters of suspense which make up the bulk of the original story, conceding the fact that a modern audience is fully aware of the connection between Jekyll and Hyde. I say dispensing with that narrative, not discarding, because the film does preserve each of the key scenes from the novella, as well as many of the peripheral characters, but always with the focus squarely on Jekyll's perspective. In so doing, the film effectively pushes much of the original story into the background, showing enough respect to permit its existence without becoming slavishly indentured to it. The result is something approximate to the relationship between Shakespeare's Hamlet and Stoppard's Rosencrantz and Guildenstern Are Dead, whereby each represents the opposing sides of a single stage. 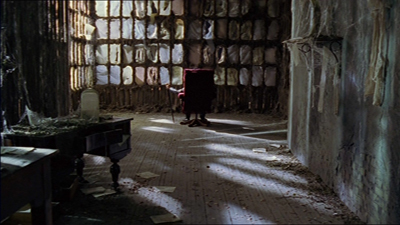 This culminates in the final scenes, where a poisoned Hyde tears and devours the pages from a journal, even as the ailing Jekyll alternately continues writing, ingeniously accounting for the discrepancies between the truncated 'full statement' and the expanded territory introduced in the film. Rather than attempt to recreate the central mystery of the novella, Dr Jekyll & Mr Hyde wisely opts to re-frame the drama and its attendant issues through a number of substitutions. Operating under the assumption that a modern audience is aware of the Jekyll/Hyde relationship, for instance, the film replaces this original source of suspense with another, revealing Hyde as late and incrementally as possible in order to pique our anticipation. The new territory into which this adaptation expands also allows it to throw in a subdued eleventh-hour surprise, giving us at least a taste of what the original audience must have experienced. By far the greatest value in this film, however, derives from its treatment of Jekyll/Hyde and how it reflects upon the values of nineteenth century society. Whereas the modern idea of Jekyll/Hyde tends toward the universal – an archetype of duality, in which the absolute principles of good and evil struggle for supremacy – Dr Jekyll & Mr Hyde confines itself to the very specific context of the era during which it was written. Odd though it may seem, some of the more drastic changes to the original source material actually result in a more faithful translation of its underlying ideas. 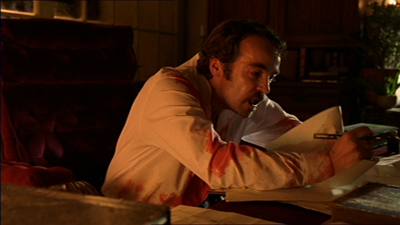 The decision to forgo any special effects, for instance, and have the transformation into Hyde conveyed purely through John Hannah's very capable acting, does much to restore one of the most neglected and yet vitally important aspects of the original work. Jekyll and Hyde are not simple paradigms for good and evil, if you read Strange Case carefully, nor indeed do they represent an equal fifty-fifty dispensation of the whole man. Like all of us, Jekyll represents a mixture of 'high' and 'low' qualities and urges. His attempt to artificially rid himself of this conflict is what inadvertently gives rise to Hyde, who is an anomaly in that he represents only the latter. While Hyde is thus purely 'evil' – in the sense that he possesses no ingrained sense of social mores, and is therefore utterly selfish – Jekyll remains entirely as good and evil as he ever was, still an entire person. The lack of any jarring physical delineation in the film allows this idea to retain its full potential, as we are never quite clear when we are dealing with Jekyll, or if it is actually Hyde. 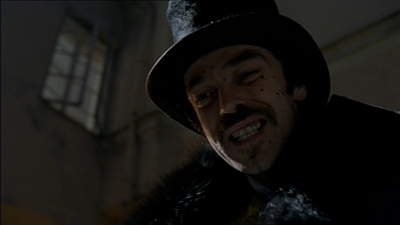 In this respect, Dr Jekyll & Mr Hyde also manages to address one of the difficulties relating to any adaptation of the original, which is making Hyde sufficiently evil. In the novella, all but a few of his atrocities are left to the imagination, and thus able to remain absolute in our minds. When it comes to film, however, this becomes difficult to adequately portray. It is no great task to imagine some fairly atrocious crimes, but the task of envisioning the most atrocious, befitting the actions of someone who is supposed to be the utmost evil, is something altogether different. In conjunction with the issue of good taste, any portrayal of Hyde faces the real possibility of seeming too paltry and contrived. Dr Jekyll & Mr Hyde, however, takes this potential weakness and uses it as the basis of a scathing indictment of late-nineteenth century society. No matter what depths of depravity Hyde is able to contrive, it seems that someone is waiting to profit from his actions, whether it be via blackmail, organised debauchery, or a mutual concession. The protagonist is thus recast as a paradigm not of duality, but fundamental hypocrisy, with Jekyll using his privileged status as a shield within a society content to abet his crimes. 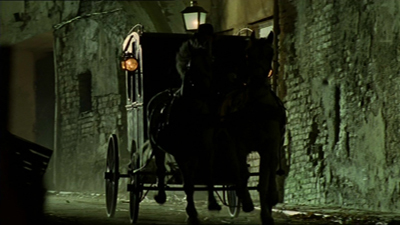 Inspired by the graphic novel by Alan Moore rather than a true adaptation, From Hell is nevertheless a gripping and stylish film dealing with the notorious exploits of Jack the Ripper. While it opts for a more conventional, procedure-based approach than its source material, the rampant hypocrisy at the heart of Victorian society remains a central concern, showing a political focus that balances well with the more domestic appraisal of Dr Jekyll & Mr Hyde. 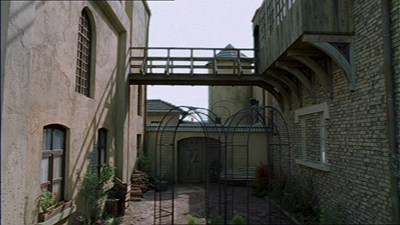 More than a little influence in terms of visual motifs and composition is also evident between the two films. A milestone insofar as it introduced a powerful and enduring concept to the common milieu, and yet the tale itself is largely neglected. While the original reading experience has long been eradicated, thanks to the popularity of its central idea, the modern reader has the alternative surprise of finding many of their preconceived notions about the story disassembled and replaced by a far more nuanced, qualified examination than the common understanding of a potion-quaffing simian menace. This particular edition has the benefit of some fascinating and insightful articles by Robert Mighall, and also features two of Stevenson's other, more conventional “shilling shockers”. The only novel-length work of fiction penned by the legendary Oscar Wilde, The Picture of Dorian Gray was published four years after Stevenson's Strange Case and deals with similar issues, namely the apparent duality of man, the role of society in mediating individual behaviour, and the prospect of leading an existence free of moral consequences. Whereas Strange Case places a heavy focus on the evolutionary implications, with the physical transformation of Jekyll into Hyde, Wilde opts to tackle the issue from a purely philosophical and theological angle: what is man, in terms of the psyche, as opposed to what is man, in terms of physical human being. In many ways The Picture of Dorian Gray is thus something of a companion piece to Strance Case, indicative of the highly topical nature of their core issue during the later nineteenth century. Primarily remembered as a cautionary tale concerned with the potential abuse of medico-scientific advances, The Island of Doctor Moreau also conveys a scathing indictment of the society which is generally thought competent to guide or censure such advancement. The result is a blurring of the lines between man and beast, forcing us to question the validity of so called 'civilised' behaviour, and ultimately the very social mores that typically delineate right from wrong. Like Strange Case, the result is a muddying of both parties in the cyclical relationship between individual and society, questioning how it is possible that society can regulate the activities of immoral specialists, such as Moreau, when the common populace itself is explicitly compared with brutish, unthinking creatures born through his malpractice. A monumental work of graphic fiction, as attentive to the minutiae of its subject matter as it is sweeping in the grand scale of its concepts and intimations. Dispensing with the typical cat-and-mouse scenario of mainstream crime fiction, From Hell follows the exploits of Jack the Ripper throughout the frenetic killing spree that rocked London during the later months of 1888, vividly and intimately portraying both he and the vast network of individuals concerned directly or indirectly with the events that saw his moniker indelibly etched in modern history. Crucially, this is an exploration that manages to damn the society that spawned the Ripper without diminishing the horror or brutality of the acts for which he is ultimately culpable.